I'm generally quite a big fan of Pelikan pens. 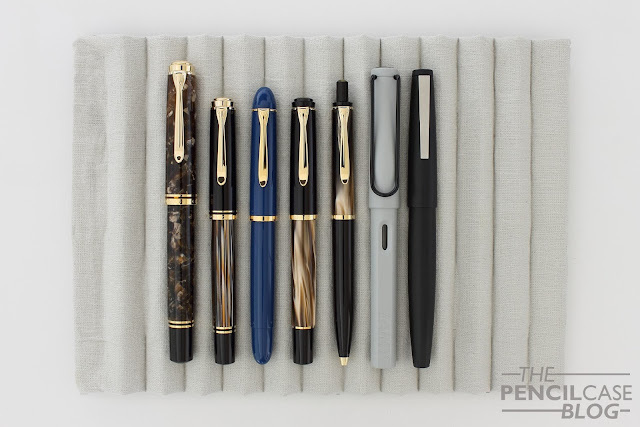 Their design aesthetic and fantastically smooth nibs are right up my alley, and most -if not all- pens I've bought and used from them have consistently been able to get a smile on my face. If I had to pick my favourite, I'm fairly certain it would be the Souverän M800. They are large but not too large, and the brass piston mechanism adds some heft. 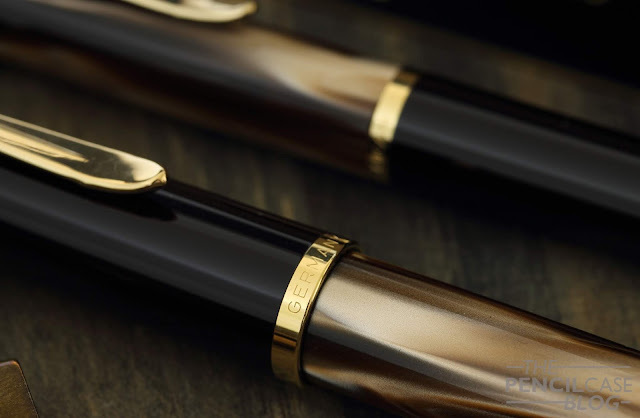 The M800 has also been Pelikan's base model for special editions in the last few years, which brings a wide variety of material and color options to choose from. But these are not cheap pens at all! 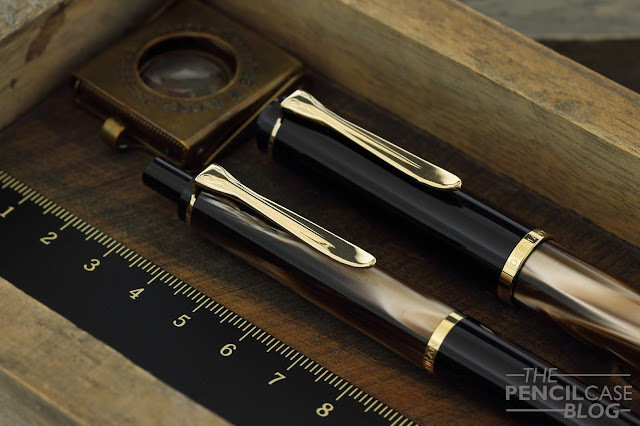 I can see how a first step into Pelikan pens can be a bit daunting, shelling out a couple Benjamin Franklin's for a Souverän (or any pen in that price range, for that matter!) might seem ridiculous. Ok to be fair, the premium you pay for Souverän pens does get you extra bling, where the M200 is a more sober, trimmed-down version. Those few extra trims do make a noticeable difference in appearance, and give the Souverän a more luxurious look and feel all around. If you look past that though, the M200 is hard to tell apart from more expensive pens. Especially this new brown marble finish is exceptionally well-done, and makes you forget this is about less than half the price of its direct Souverän counterpart (the Souverän M400). The brown marble material has pearlescent brown-beige (almost orange in some areas) streaks that contrast strongly with the dark brown base material. The brown marble resin is offset by very dark brown (almost black) opaque resin parts for the cap, section and blind cap (same as with the Souverän M800 Tortoise, Burnt Orange and Renaissance special editions). For the most part, I don't have negative things to say about this pen. 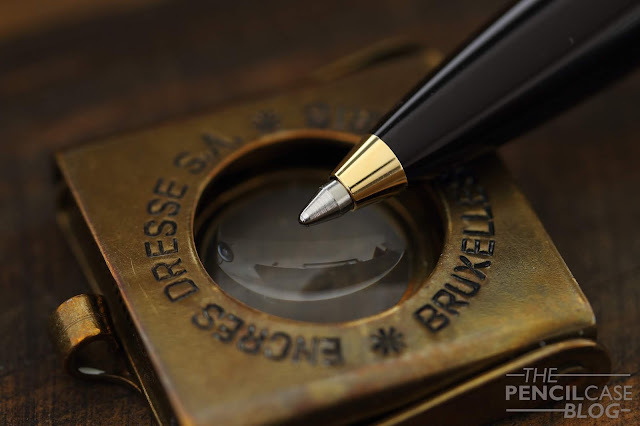 Build quality is good, everything fits together nicely and Pelikan outfits their cheaper offerings with the same excellent piston-filling mechanism as seen on the Souverän. BUT... 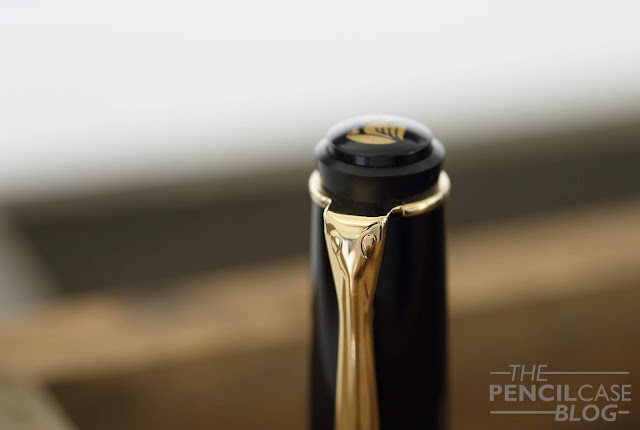 It's unforgivable that after all this time, Pelikan still isn't able to properly polish away the seams that remain visible from injection moulding the grip section! I made this remark a long time ago when I reviewed the M205 (HERE), and they really should do something about it because it's not something you should see on a 100$+ pen! Another -minor- complaint would be the plastic finial. Some versions of the M200/M205 already come with a partially metal finial, which makes a huge difference in 'premium' appearance. I'd love to see them implement this on all their Classic pens consistently. 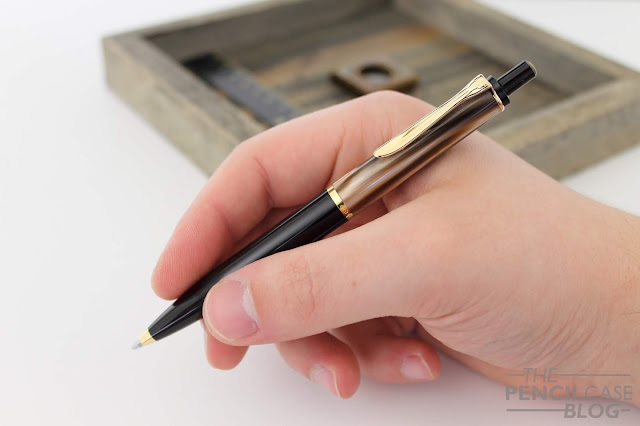 The M200 is a fairly small pen, measuring just 12.6 cm (5") closed and 12.1 cm (4.8") uncapped. For me, it balances on the edge of being too small to be used comfortably unposted (I have medium-sized hands, I guess?). It's a narrower pen, going down to 9 mm (0.4") around the section. Being all-resin, it weighs in at a mere 14g total, especially uncapped that makes for an extremely light pen. I prefer a bit more substance, so I use it posted to both get some extra length (14.9 cm/ 5.9") and weight. 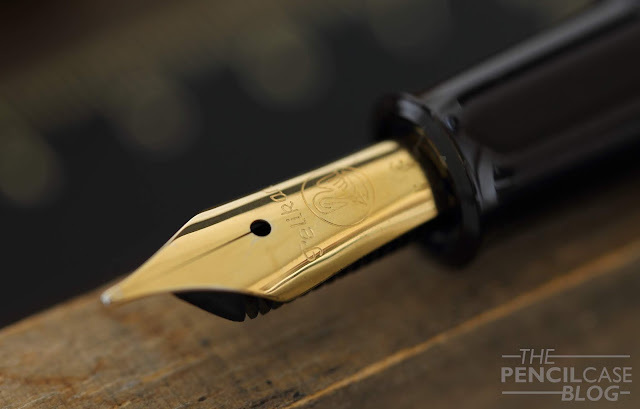 Pelikan's steel nibs I have long ignored, which was unfair of me. Designwise they may be a touch bland (especially compared to their Souverän counterparts which are amazing!). But truth be told, these are excellent nibs: fairly rigid but not rock-hard, smooth with just the right amount of feedback and most importantly very consistent! I filled it up with this year's Edelstein Ink Of The Year: Olivine. The flow is definitely on the wetter side, which is something I personally like. This is the second fine steel nib I tried from Pelikan, and I quite dig it. In true Pelikan fashion, it is not particularly narrow for a fine, but it's definitely not to be confused with a medium. As I said it does give some feedback, but the pleasant kind, it's by no means scratchy. The only issue I keep running into with Pelikan's gold-plated steel nibs is that the plating doesn't seem very consistent. 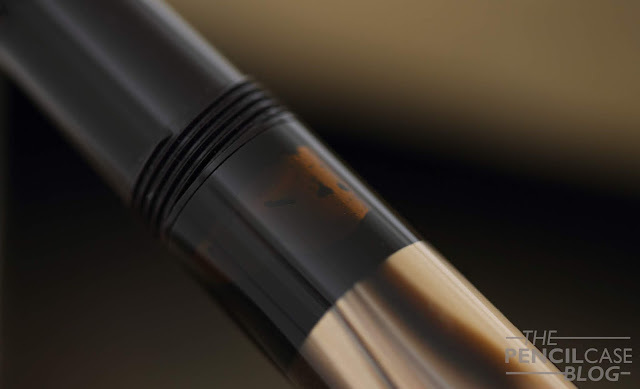 I don't know why this is so apparent on Pelikan pens, but obviously it's an issue that shouldn't even be remotely visible on a pen in this price range. 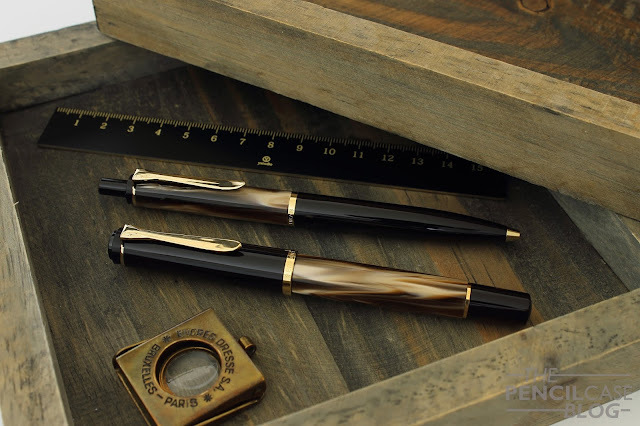 I only talked about the fountain pen up until now, but to make a nice set you can also get the matching brown marble K200 ballpoint. 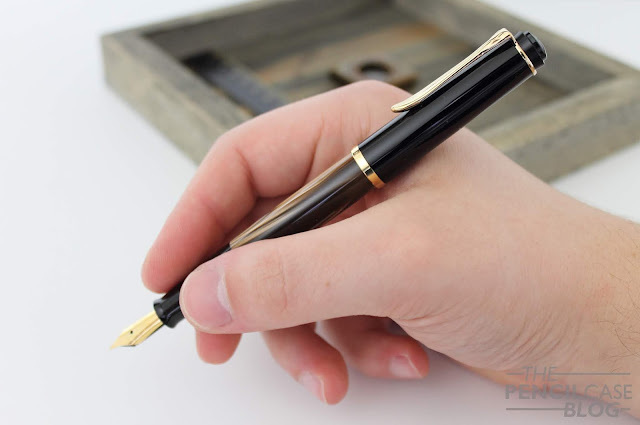 It's similar in size to the fountain pen, and features a classic knock mechanism instead of a twist mechanism like that found on the larger K800 (I reviewed the K805 Stresemann HERE). It's resin on the outside, but has a brass sleeve inside that adds some weight, yet it remains rather light and comfortable in the hand. The profile of the K200 gets quite narrow towards the front, which gets a bit uncomfortable after a while, at least for me. 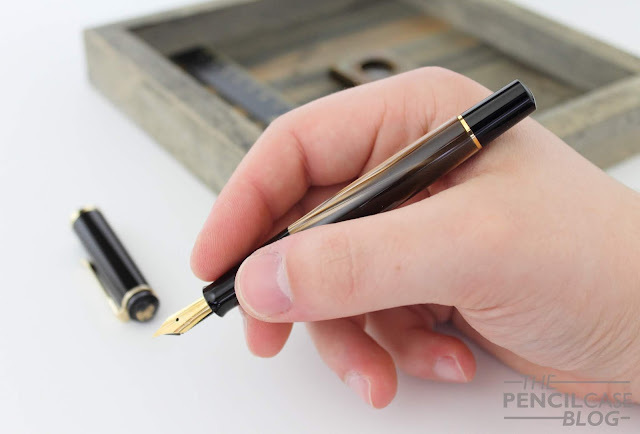 The K200 comes with a black medium Pelikan refill (Parker G2-style refill). It lays down a crisp, rather fine line and is plenty smooth. I just would've preferred a slightly darker line, but that's a general critique on ballpoint pens. To summarize, the Classic M200/K200 isn't flawless, and holding it next to a Souverän will inevitably always make it feel like a 'cheaper alternative'. 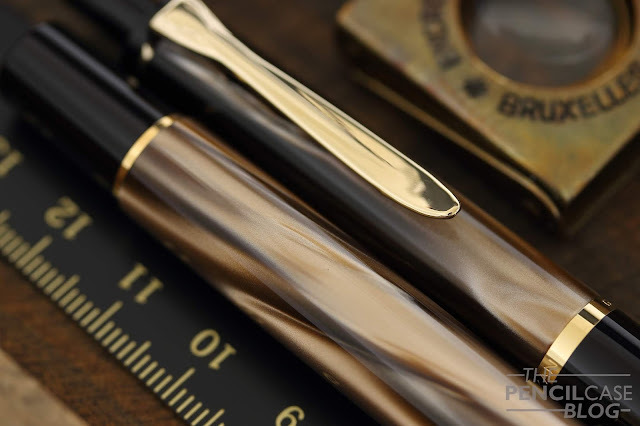 That being said, the M200 brown marble is a fine pen to have a first go at Pelikan's luxury offerings. Can the M200 Brown Marble replace the magnificent Tortoise brown material? It's not super-cheap (115€/ 135$ for the fountain pen, 100€/ 130$ for the ballpoint), but at half the price of the cheapest Souverän it's definitely a more tolerable option. You still get the same classic design that the Souveräns are known for -be it in a slightly less elaborate packaging. This particular brown marble colorway in particular is a clear winner in my book, and it surprises me that it got very little attention since its release. It's not too dissimilar to the iconic tortoise brown material, so the brown marble might be a valid surrogate if you missed out on that one? 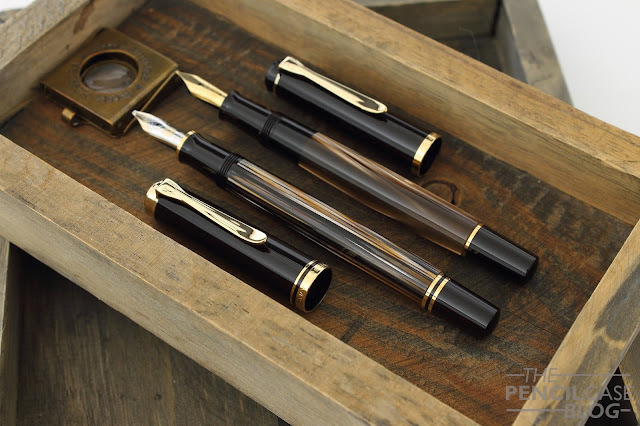 This product was provided on loan by Pelikan, so I could write this review. I was in no way influenced in the making of this review, the opinions shared in this review are completely my own! This post does not contain affiliate links.